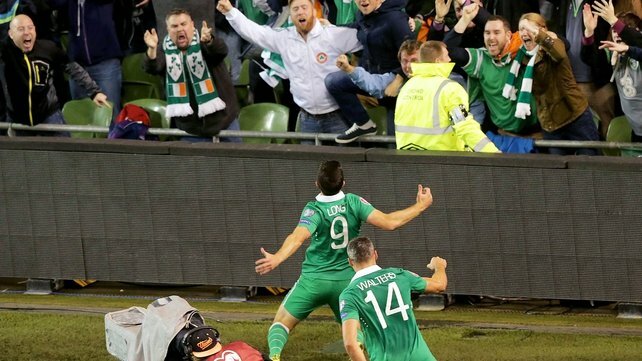 Shane Long sprung from the bench to crash home the winning goal as Ireland shocked world champions Germany with a 1-0 win in a breathless EURO 2016 qualifier at Aviva Stadium. The Ireland striker raced through onto a long ball before unleashing an unstoppable strike past Manuel Neuer in the Germany goal. Ireland had dealt with non-stop German possession for the first 70 minutes but it was nothing compared to the final 20 as every green jersey defended with absolute valour to see the game through and record an historic victory. The Ireland starting eleven proved a bit of a talking point to most, but Germany’s start to the game certainly didn’t surprise as they took control of the match from the opening minutes, passing their way into the Ireland half and winning early corners that would put immediate pressure on the Irish defence. Ireland, to their credit, broke out of their own half on occasion and tried to maintain possession. There was a modicum of success but nothing to really trouble the German goal. Another corner in the ninth minute caused concern as centre-half Jerome Boateng towered above the Irish defence to direct a fine header goalwards, but Shay Given was untroubled and the ball flew over the bar. Despite all the German possession and intricate play around the periphery of the penalty area, the Ireland keeper didn't actually have a save to make. But Germany were getting closer. Ilkay Gundogan should have opened the scoring in the 13th minute as the German pressure rolled in from the left flank. The ball was eventually pulled back to the arriving Borussia Dortmund midfielder but his goal bound effort was deflected over after some last-ditch defending by John O’Shea, as the Sunderland man threw his body in front of the shot. It was O’Shea’s central defensive partner, Richard Keogh, who was next to thwart the Germans as his outstretched leg intercepted a fine cross from Matthias Ginter with Mario Goetze waiting to divert the ball into the empty net. Germany eventually found the back of the net as Mesut Ozil’s front-post run beat his marker and the Arsenal man produced a deft touch to divert the ball home but the linesman was perfectly positioned to make the call, and it was the right one, as the goal was disallowed for offside. Ireland eventually threatened the German goal in the 24th minute after the ever-eager Cyrus Christie worked some space in the right corner before drilling a low ball across the goal. Walters nipped in ahead of Hummels at the near post and while his flicked effort was on target, it didn’t trouble the keeper. Germany maintained the pressure but still failed to hit the target and the closest they came for the remainder of the half was five minutes before the break when Ozil arrived at the back post to get on the end of a Muller cross but his first-time effort whistled past Given’s right post. 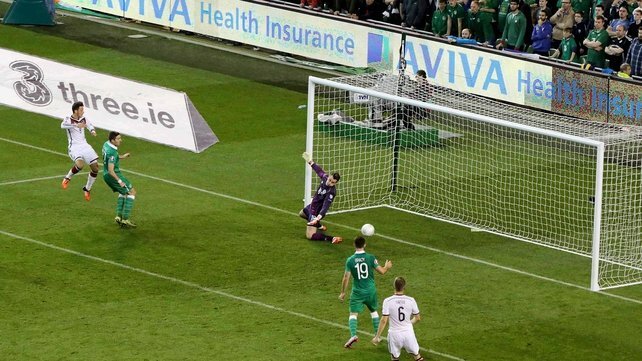 The Ireland goalkeeper departed shortly afterwards with a twisted knee and was replaced by Darren Randolph as the sides went in level at half-time. It was more of the same early in the second half but the frustration appeared to be creeping into the German attack with Andre Schurrle’s long-range effort drifting high and wide - the best the visitors could muster in the opening five minutes. Ireland were starting to make inroads into the German box and a high ball gave Walters the chance to let Neuer know all about his physicality; the referee, however, was quick to penalise the Stoke City striker. The challenge had the desired effect on the crowd however, as the decibel levels soared inside the stadium as Irish supporters sensed there could be something special happening under the Lansdowne lights. However it was Germany who almost grabbed the lead after a sensational kick-out from Neuer sent Marco Reus motoring down the left wing. Reus cut inside and played an inch-perfect cross to Schurrle who was arriving at pace, but the former Chelsea man could not find the target and Ireland remained in the match. Irish confidence was growing as Hoolahan, as ever, jinked his way into space on the edge of the Germany box in the 64th minute. The Norwich City magician’s shot was blocked but the ball rolled kindly for Jeff Hendrick, however, his shot whistled past the left post. Randolph’s long clearance sailed over the half-way line and bounced between Mats Hummel and Jonas Hector with neither German defender dealing with the dropping ball. Long raced through at breakneck pace and his first touch set himself up perfectly, before he smashed the ball past Neuer who had no chance of stopping the venomous effort. The stadium erupted as Long was thronged by his team-mates, while the World Cup winners were shell-shocked to go behind having dominated throughout. The Germans almost hit back within two minutes as Hummels attempted to direct a header back across goal, but Randolph was happy to watch it drift past the post. But then, six minutes later, the ball was pulled back to the penalty spot and, as if in slow motion, goalscorer supreme Thomas Muller set himself to slot the ball home with no green shirt to challenge the Bayern Munich man. Muller somehow managed to guide the ball back from where it came but it went just the wrong side of the post in one of those moments when the home side must have felt it would be their night. There was still another 12 minutes for Ireland to survive and Randolph was called into action twice, saving high and low from Boateng and then Gundogan. Ireland eased the pressure whenever they could with man of the match Hoolahan and Hendrick both eating up valuable seconds as the game pushed into injury time. Four more minutes to endure, but the Boys in Green held firm and even managed to work the ball into the opposition corner as the clock ticked on, slowly. Germany’s last chance was a tame header, which Randolph gathered up without any problems and with just over 94 minutes played, referee Carlos Velasco Carballo brought the whistle to his lips and sent the capacity crowd into a frenzy. The stadium was still rocking 15 minutes after the final whistle as all eyes turn to Warsaw on Sunday with automatic qualification still very much a distinct possibility and a play-off berth already secured as back-up. Republic of Ireland: Shay Given; Cyrus Christie, John O’Shea (capt), Richard Keogh, Stephen Ward; Jeff Hendrick, James McCarthy, Robbie Brady; Wes Hoolahan, Jonathan Walters, Daryl Murphy. Germany: Manuel Neuer; Matthias Ginter, Jerome Boateng, Mats Hummels, Jonas Hector; IlkayGundogan, Toni Kroos, Marco Reus, MesutOzil; Thomas Muller, Mario Goetze.